“Best cooking class ever!! !” Caroline, teacher of Intermediate B, said today. The class started with some recipe research on the internet. Followed by a trip to the supermarket to buy all the ingredients. Then the cooking started, tables were checked and there was a special guest ‘Daisy’. Ending with the eating of all the lovely food. Just another day in Byron Bay. We all remember how hard it is to start a new life in another Country, that is why at BBELS we try to help students with everything they may need. Such as a mobile phone, a bank account, a Tax File Number (TFN) or even going to the doctors or supermarket. That is why every Tuesday morning at school students get help opening a bank account. This is probably a student’s first real English lesson, and it’s free!!! This is also a great chance for students to learn some useful English w: withdrawal, deposit, ATM, EFTPOS, balance, statement, lend, borrow, interest, currency, transfer, overdrawn. Sam our lovely banker is here every Tuesday from 8:15 -9:00 to help students open a new account. You can join him any Tuesday if you need help, or have any banking questions. If you stay here for 12 weeks or more you may go to the Farmers Markets, have a cooking class and maybe even visit Currumbin Wildlife Sanctuary. This is a great and fun way to learn English. What and how long have you been studying at BBELS ? I’ve studied for three months, attending an IELTS course in order to get the necessary skills to take the exam. What do you like best about BBELS ? It’s a difficult question because my stay at this school has been amazing and for this reason I can’t find any negative aspect. If I have to choose, I think that the best thing that this school can give you is the opportunity to meet and know people coming from all over the word and to understand and find out new cultures that you can’t find in the school’s book. 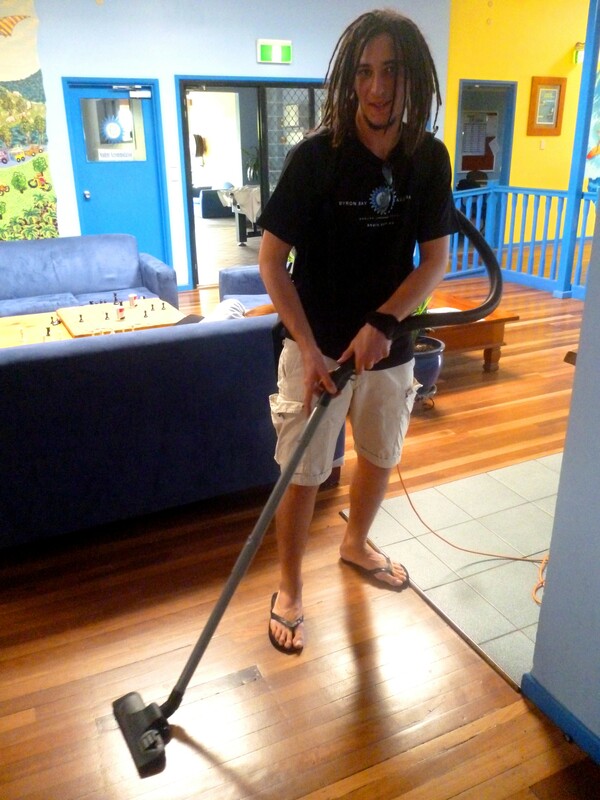 Since I am in Byron I’ve done different kind of jobs. I’ve got some of them applying through the school’s “ Job Club “. This is one of the facilities that the school offers to you. 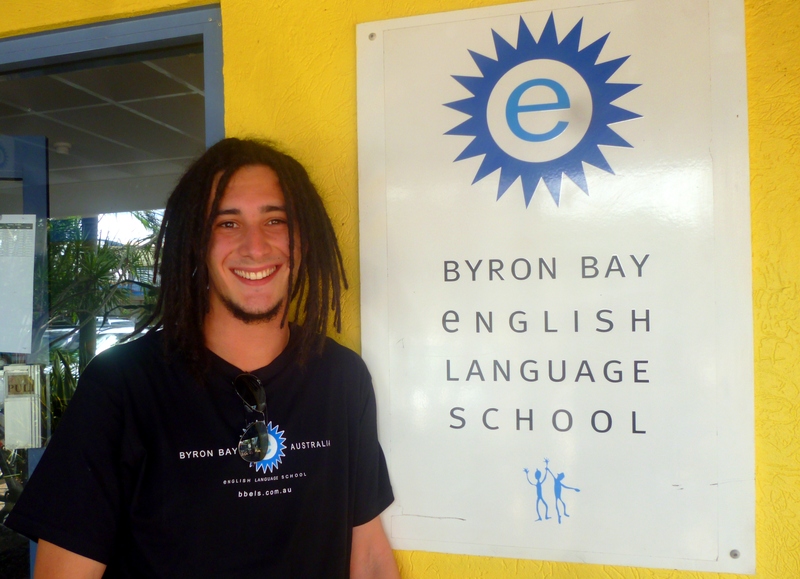 It allows you to get a job in Byron Bay and If you have a Working Holiday Visa, to get your second Visa. The other way to find a job in Byron is to give your resume to all the shops, restaurants and keep going doing it because the competition might be difficult during the summer as it is high season. Last but not least important is Gumtree. It’s a web site where periodically the employers publish advertisements for stuff. Where do you work/ where did you work? I worked at Corner Shop as a “ fridge boy “ and kitchen hand and at “Eatery” as a dish-washer and waiter. I got this two jobs giving my resume around Byron. Now I’m working at the school as a cleaner and at Chicken Factory in order to get the second Visa. I’m doing this two jobs thanks to the school’s “Job Club”. I really love this place. If you need some knowledge concerning how to treat the environment, you should spend part of your life in Byron. Here you can learn how to live and respect the nature but the most beautiful aspect of Byron is definitely its “easy-going” lifestyle and passion for art. You can see every day artists performing around the town making even a cloudy day amazing.